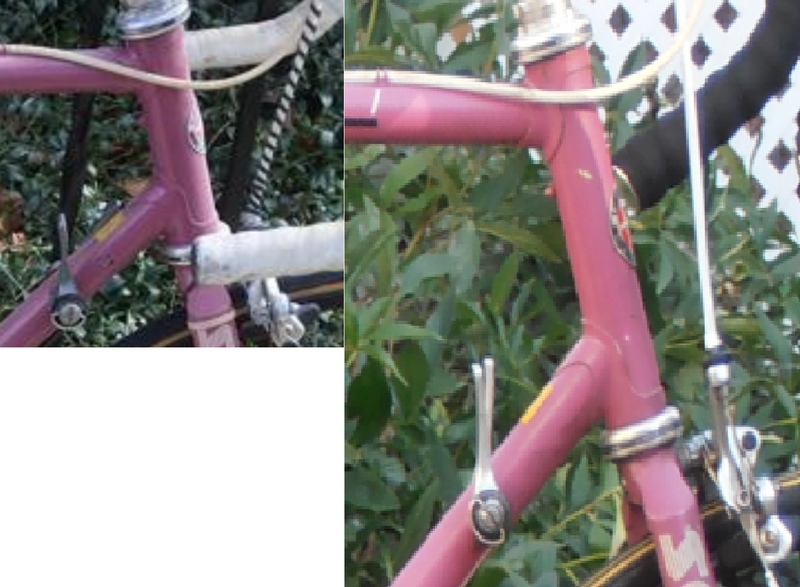 What vintage frame size for me? I am looking to buy a 87' Schwinn super sport from someone but I'm a bit unsure of how sizing works for vintage bikes. I am 5' 9.5" with a pant inseam of 32" (probably around 32.5-33 cycling inseam). I typically can fit into either a 54 or 56 ETT sized bike depending on geo and with varying stem length. My current road bike has a 54.5 ETT and I run a 130 mm stem on it. Because the schwinn I'm looking to buy will be used primarily as a commuter with the occassional ride I would prefer a slightly more relaxed geo--relative to my current bike maybe a 110-120 mm stem. For a traditional bike what frame size would fit me? I looked at some old vintage frame size charts and it lists 56 cm as the appropriate size for my height and inseam. The seller sent me a picture of the bike which he says is a 54 cm frame but looks to be closer to a 56. What frame size does it look like to you and would it fit me? Looks bigger than 54 to me. Best is to just try it out, give er a spin. Measure from the center of the bottom bracket to the top of the seat tube (or top of the top tube along the seat tube). I doubt that bike is a 54. With the vintage bikes, I think it was typical to have a shorter seat post, and the bars close to level with the seat. So, slightly larger sizes. The modern "Racing" bikes have emphasized high seats and low bars, and it gets exaggerated when using sloping seat tubes. But, for the recreational bike, tall head tubes raise the bars above what might be predicted with the seat tube height. Anyway, choose a bike you like and are comfortable riding. A 56 sounds close. Some sellers measure to the center of the top tube, which could account for the discrepancy. Just make sure you and the seller are using the same measurements. Good point. Doesn't only matter for seat tube measurements? For top length isn't the same both ways? For a horizontal top tube, it is measured center to center (and most people seem to do that). Sloping top tubes may be different, and I think are often measured from the center of the seat post level with the top of the head tube. Thank for the replies. I had another question. If I get this bike I would be putting fresh brake pads and probably pad holders on it. Are the shimano 600ex calipers compatible with newer modern pad holders? You should have no trouble finding replacement brake pads. They should swap in just fine. One nice feature of newer brakes is the domed washer that lets you angle them as you wish. That makes fitting them even easier. Well I certainly hope its not a 58. If so I will have to look for another bike. I looked at several pictures of 56 and 58 sized vintage schwinns and the difference is hard to discern visually. After I confirm with the seller I'll go from there. I have the same 32" inseam, but I am 6'-1", short legs, and I use a 57-58 cm frame in vintage, with 57 working best for my use. My CAAD 10 is a 56cm frame, but I am sure i could safely and comfortably ride a 58cm. Just a FWIW. Too much thinking, go ride it. Bring allen keys so you can adjust the saddle and rotate the handlebars to your liking. Below is a 58cm. That's why I'm trying to make sure the sizing is okay. On a different note is the stem on the super sport threadless? So if I wanted to bring the stem lower or swap it out I would be able to do so easily? Last edited by bleumeon; 03-22-17 at 06:11 AM. Yeah, what he said. I'm 6'-0" with a 32" inseam, and this '88 frame is about as good a fit as it gets for me with a mass-produced frame. It measures 57cm from the center of the bottom bracket shell to the center of the top tube. It is a threaded stem. Easy enough to lower, but you would need to change it for reach. If you line up the top of the lower tube with the schwinn logo the line will bisect the logo in my image. In the 58 posted it does not bisect the logo. Before vintage was vintage, we'd stand over the bike and make sure there was room to lift the bike up a " bit". If the price is right on that schwinn, and the model is what you want, buy it. I'm your size and all my bikes are 59ctc. Thanks, that gives me more confidence in the purchase. fit will vary quite a bit. I am 5' 11" and a 58 ctc is the minimum with 61 the max. 59 or 60, again ctc, are the best fits for me. Another C&V measurement is the crotch bone height (CBH). You measure in bare feet from the floor to the CB. Use a book and measure. Mine is 35". Some may say my legs are longer than "normal", but that is someone else standard, not mine! I always use center-to-top, measured along the seat tube, as well as center-to-center, measured along the top tube, to get a good idea regarding how well a given frame will fit me. I stand 5'8" and buy pants with a 30" inseam, and I find a 55cm frame ideal, assuming a horizontal top tube and typical bottom bracket height. FWIW, frame dimensions can be misleading, or at least confusing. There are only two crucial dimensions, the standover height and the TT length. Standover height is obvious because that's how much crotch clearance you'll have when you put your feet on the ground. It can be measured easily - just stand a meter stick beside the bike but make sure the tires aren't flat. If standover height is too high there isn't much you can do about it. Well, to buy a little bit of standover height you could swap out 27" wheels for 700c, or run smaller tires, or wear platform shoes. Top Tube length is one factor determining how much you have to reach forward for the bar and brakes. As someone else mentioned, raising the stem can help with a reach that is too long, but you can always swap the stem for one with a different reach. But here's the thing - In the old days it was sort of assumed that most frames were built to the same general proportions. Thus you could supposedly judge a frame by just one key length, the Seat Tube. (Even so, some people/manufacturers measured center to top of the TT, some measured center to center of TT, and some even measured center to top of seat lug which could be higher than the top of the TT). The truth is, frames weren't shaped the same, so one dimension wasn't a good way to characterize its size. Different frames of the same size might be described as "close-coupled" or "race geometry" or "relaxed" but that was just a subjective way of saying the proportions were different. Since you can run the seat post up and down, ST length turns out to be not so significant in itself. A corollary of the same-proportions assumption is that you could judge a frame's size by the Head Tube length. In fact, HT length can also be deceptive. I have frames which by that criterion would visually seem too large for me but fit very nicely. Likewise, the BB height above the ground can vary from frame to frame. My BB heights vary by at least 15mm highest to lowest. Since you adjust seat post position for the bottom of the pedal stroke it can result in visually different exposed seat post lengths for the same nominal ST length. The best way to judge the frame is to ride it, or at least stand over it with the tires pumped and you wearing the shoes you would wear for riding. Last edited by jimmuller; 03-22-17 at 08:42 AM. I'm going to state the obvious here. If you're not familiar with vintage bikes you shouldn't be buying them over the internet. Buy one locally so you can ride it and test it out. Yes, it's a pretty bike but yes, there will be some available to you in driving distance eventually. Look for police auctions, university auctions, etc. Classic bikes often ride completely different than modern bikes, and you may find that you want to size up or down accordingly. EDIT: Also, geeze, a 130mm stem? WHY? You need a bigger bike... You could easily ride a 56. I'm fairly flexible and I use that for my fast rides with a lower more aggressive position. If I were do redo the purchase I would get a 56 frame but with more aggressive geo so I could shorten the stem without changing my saddle to bar drop. This bike would be intended as a commuter but I'd still like it to feel fast and nimble enough to take it on the occasional ride. My cycling inseam is roughly 33" so for sure I should be able to clear the top tube based off some old sizing charts I looked at. Anyhow, yes buying in person would be better but I don't have the time to look around at the moment. I need a designated commuting bike asap as I will be moving later for a job and plan to bring a bike on the plane for my commuting needs. You sound like you have my build. I think that bike would ultimately be fine, it looks like a 56, but I can also see you wanting something a touch smaller. I personally like my standover height to err on the side of nowhere near my balls. I like my bikes in the 55cm range. You just have to ride it to know.